There is an internal debate going on right now on whether this was a policy decision (which would come under the jurisdiction of the USATT Board and Tournament Committee) or part of the day-to-day running of the sport (which is run by USATT headquarters). It does seem like a big policy change, but at this point, with only one week left in my four-year term, I'm going to let my successor and others on the board debate on this issue. But there really are two questions: Who should make this type of decision, and whether it was the right decision. Below is the email I wrote to the board when we started receiving emails complaining about the cut in prize money - I since found a copy of last year's entry form. The James is James Therriault, who first emailed the board on this issue. I confess that I proofed the Nationals entry form in advance and didn't pick up on the prize money cuts. No one said anything about this big change and I proofed mostly the wording, and so didn't catch it. (I also didn't have a copy of last year's entry form to compare it to. Does anyone have a copy, or is there one still online? The 2018 US. Nationals page doesn't seem to be online anymore.) The first I knew about it was from the letter from James. Presumably these were cost-cutting changes from headquarters, but I really don't know - it wasn't a board decision. Like James and Dan, I'm a little leery on what the effect is going to be for members when they see the cuts in championships events, and how it will affect entries. I think it's a good time for a broader discussion about the Nationals. When I stand in the middle of the playing hall, it's hard to tell by looking around what year it is (or even decade). That seems somewhat odd. has been able to draw some sponsorships (thank you, partners! ), but not enough to transform any significant aspect of the event. Now a few things have been tried in recent years, including the separate finals venues and all-court floor mats at the World Vets and the Open. But none of those have been transformative either, and the notion that we should just find someone who will rain sponsorship money on the event is a nice idea that's been tossed around forever without consistent results. Throw into the mix what we have been hearing about Las Vegas as a venue, that it's getting more costly as a site and that our really good deals there may be gone. What are some questions and options? Why is the event so costly to run? The financial losses seem real despite the high level of entry fees. Maybe it's easier to explain in light of the number of matches or some other variables, but it's probably worth understanding better. Would splitting off some other events make sense and permit more growth? Perhaps it's time to consider a separate junior or senior Nationals. The World Vets seemed to bring out many U.S. players who don't go to the Nationals, what was better about that? Should we aim to elevate the top player aspect of the event, with better presentation, prize money and a push for spectators? Or enhance the average player's experience, as they are most of the base and paying most of the freight? Or should these be two different tournaments? Should players continue to be able to enter the Nationals directly, or should there be regional qualifications in some way? Perhaps these could be a source of growth. What about small cash prizes for ratings and age events (the topic of these emails)? Are they essential, or would nicer awards and some enhanced prestige factors be an effective substitute? What about local organizing committees that might want to build the event over time? For example, Grand Rapids did a nice job with its Opens in local sponsorship and publicity, but some players said they didn't like going there. Are we better off in a bigger destination city, but mostly ignored? Do we care about growth, or is this just a good service to members in its present form (with only fine-tuning needed)? USATT HQ staff are pressed already with all they have to do, and the Nationals and Open activities absorb up a great deal of their time and thus limit other services they could provide. Is that ok? And of course, there is no need to go drastically in any of these directions all at once -- but it might be helpful for us to figure out if there is a direction that we intend to move over time. As an innovation, our current Nationals mostly dates from the 1970s. Is it time to innovate further? Very good points, Carl. An underlying problem is that we are trying to satisfy two masters - the USATT membership that wants to play in the event, and the top players and spectators that want a more professionalized event. I suggest we consider what our vision for the Nationals and the Open should be. Here's mine. US Open: Aim to turn this into a huge annual professional event, like the U.S. Open Tennis Championships. Bid it out, look for entrepreneurs with a vision and action plan to make it so, one that would be enticing to TV and major sponsors. Hiring a CEO with the vision and ability to get this done should be key. USATT's willingness to give up some control of the event may also be needed. A one-day Giant or Tiered RR run in conjunction, perhaps at the very start or end, might be possible to draw players/spectators and raise revenue (if we can get enough tables), but otherwise only "championship" events. (This could include senior and junior events, run single elimination.) This is our "Professional" event, and hopefully a major ITTF event. US Nationals: Keep this as the classic historical event we've had for many years, with the goal of a thousand or more USATT members getting together each year in lots of events, with progressively more prize money in the major events as the numbers and sponsors go up. By having only one such event each year, instead of running both the Nationals and Open this way, means we'd get more players at the Nationals as "The Event" the members all go to each year. With a thousand players, we not only get much more in entry fees, but we can also charge sponsors more for booths and for sponsoring tables, balls, and clothing, as there would be more players. With all this extra revenue, we can afford very good prize money in major events while giving USATT members a great annual event that everyone will want to attend. We should also consider bringing back some historical things we stopped doing, such as the huge players party, as well as clinics, "Meet the Pros," and other features that would turn it into a "must attend" event for members. This is our "USATT members" event. 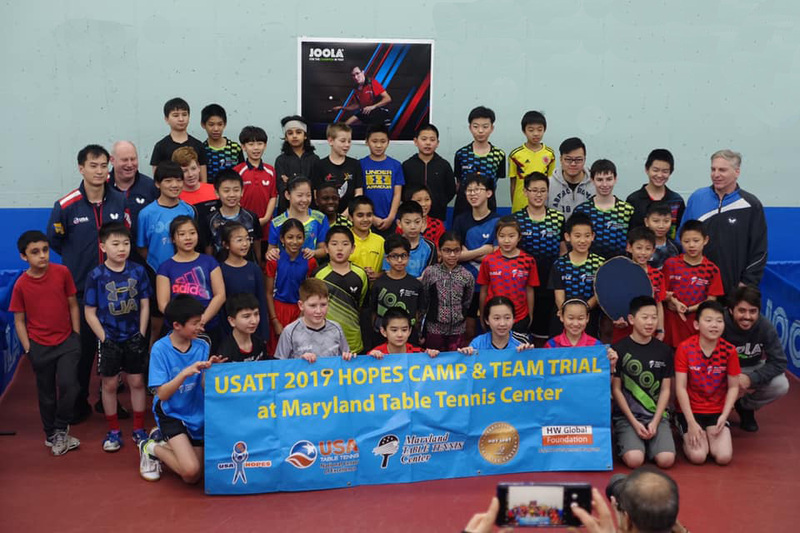 Forty-two kids, the large majority ages 9-11, congregated at the Maryland Table Tennis Center for two days of training on Friday and Saturday, and (for those born after Jan. 1, 2007, i.e. 12 and under) the regional Hopes tournament on Sunday. Here's a group picture. Here is a photo gallery by Jay Chelur. How do you run a camp with 42 players on 17 tables? Pieke and Wang organized it so that for the first three sessions, about one-third of the players would do multiball. We had four multiball tables, with Lidney, Jeffrey, Khai, and Khoi feeding as I called the drills. We generally had 14-16 players, so each table had 3-4 players. For many drills, we'd do two players at a time (the others doing ball pickup), with the players doing a footwork/stroking sequence and the rotating out so the player did the drill. Other times one player would do the drill while one or two others stood behind them, shadow-stroking the drill. We also did some interactive drills, where 2-3 players would sometimes get involved. We finished each multiball session with the "box" challenge, where we'd put a box (actually a spaghetti colander) one racket length from the far end of the table, and the players on each table would do drills where they took turns, 2-4 shots each, trying to knock it off the end. It took a number of hard shots, but when they did it, the winning team each got a "trillion dollar bill" (I had a collection of them), or, later in the camp, their choice of that or a Jolly Rancher candy. 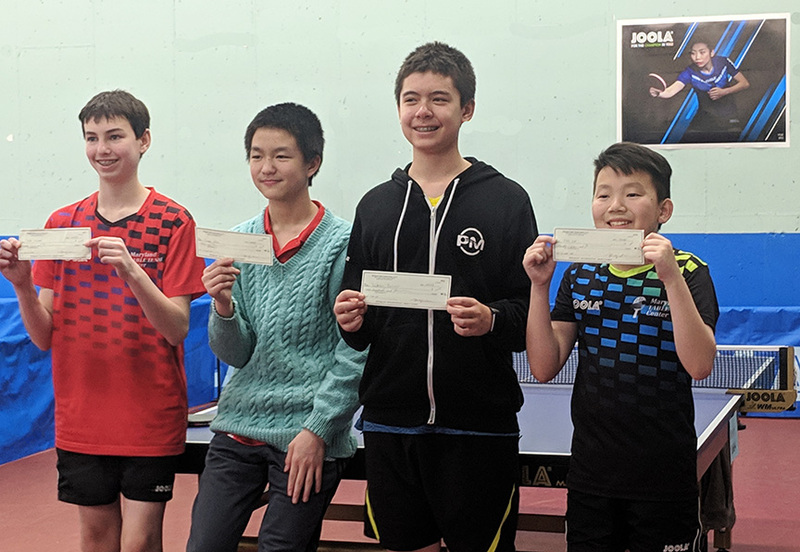 Here's a group picture of the Boys - L-R the players are Andrew Cao (3rd), Patryk Zyworonek (1st), Mu Du (2nd), and James Zhang (4th). Coaches are Jack Huang, Wang Qingliang, Larry Hodges, Pieke Franssen. Here's a group picture of the Girls - L-R the players are Rachel Ku (3rd), Michelle Kang (1st), and Rachel Wang (2nd) (Alyssa Kang missing). Coaches are Wang Qingliang, Pieke Franssen, and Jack Huang. 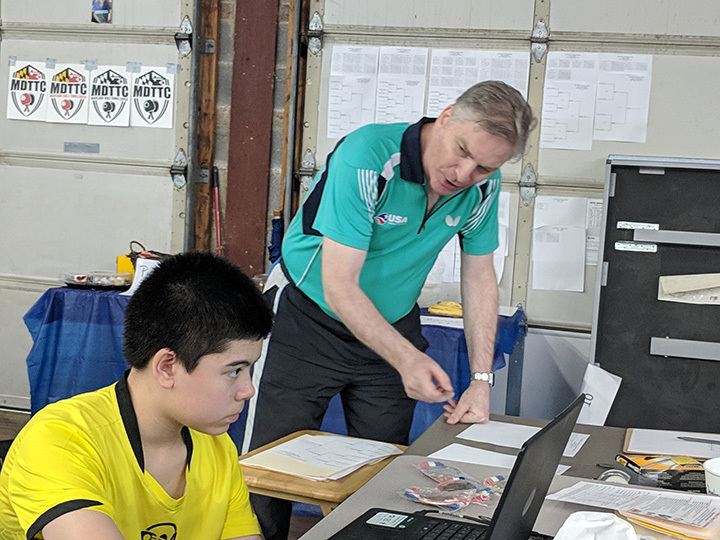 A big thanks goes to all those who helped with the camp, to the superlative job of fellow coaches Pieke, Wang, Lidney, Jeffrey, Khai, and Khoi, and to Referee Paul Kovac and Umpire Stephen Yeh, to Jackson Beaver (and half the local junior program!) for helping at the control desk, and to sponsors USATT, MDTTC, JOOLA, and HW Global Foundation. Here's the article by Michael Lauro about the Regional Hopes camp and tourament in Arkansas, with pictures and video. Here's the USATT article. If you think about it from a purely political point of view, Lily might have been handicapped. Why? Let's assume, for the sake of argument, that East Coast voters tend to vote for East Coast candidates (Mike and Lily), while West Coast voters tend to vote for West Coast candidates (Bruce). Let's also assume that Chinese voters tend to vote for Chinese candidates (Bruce and Lily), while non-Chinese voters tend to vote for non-Chinese candidates. (Remember, we're talking tendencies in a political framework.) Giving these assumptions, Bruce gets most of the west coast vote and splits the Chinese vote; Mike gets most of the non-Chinese vote and splits the east coast vote; while Lily only gets to split both the east coast and the Chinese vote. Now if someone wants to look deeper into this, they could investigate if there are tendencies, as I hypothesize here, or other ones, and also the number of voters in each of these demographics - but I'll leave that to someone else. I'm one of their coaches on Saturdays and Sundays, and I hope some of you can help out! Here is their GoFundMe page, where they are trying to raise $15,000. Until April 1, Hans & Wen Hsu, the HW Foundation founders, will match all donations for this Campaign, up $10,000. Here's the article and video (4:08). Is There a Table Tennis Offseason? Should There Be? 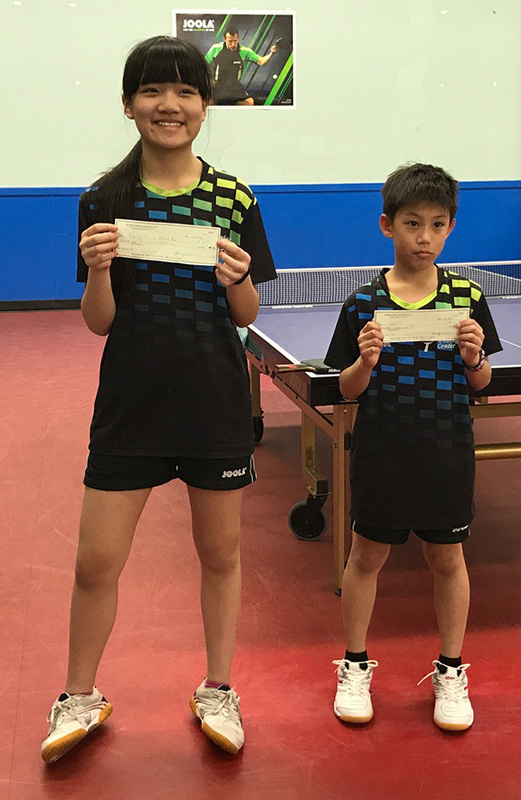 Here's the USATT article by Matt Hetherington, featuring Lily Zhang, Kanak Jha, Michael Tran, Victor Liu, and Rachel & Joanna Sung. Here's the article from MH Table Tennis. English #1 Liam Pitchford is world #17. Here's the ITTF article featuring Puerto Rican stars Adriana and Melanie Diaz. China’s 2019 Championships Team: Not Marvellous? Germany Still Chasing First Singles Gold, Will 2019 Be the Year That Changes? Here's the ITTF video (16;24). Here's the article. 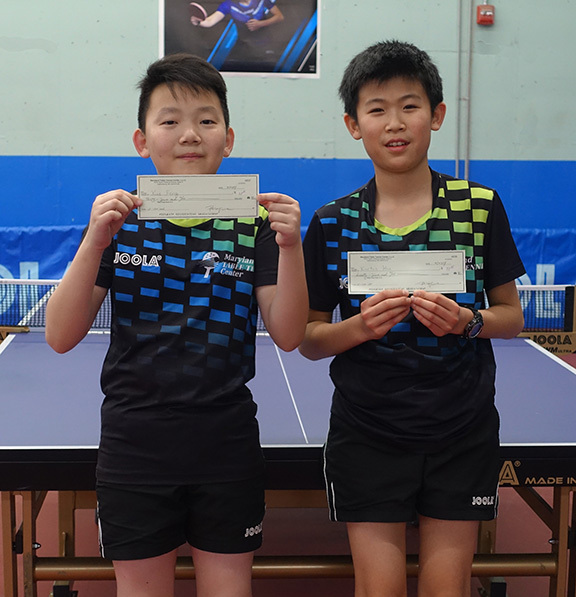 They recently sponsored my club, MDTTC. They also just signed Triangle TTC. Here's the video (1:53) of the famed French players Jacques Secrétin and Vincent Purkart. Here's the video (3:09)! Here are some of their past videos. Advice, Skill, or New Rubber?